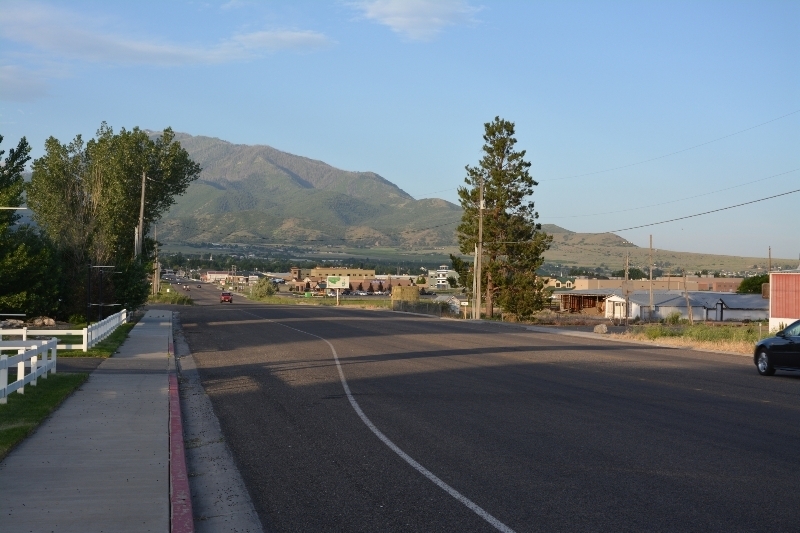 Today I cycled out of the Utah valley and over to Price. Windy today though a mixture of tail wind and head winds. In the morning cycled through populated areas. First went to UT 198 and then followed this for five miles before taking a small road 8800. A nine miles this brought me to US 6 and up the canyon. There was a gas station here and chance to get a bite to eat. It was windy here and there were wind mills at mouth of the canyon. The next 63 miles were all on US 6. While it was a direct route, I wasn’t too excited by this as a cycling route. The was often a reasonable shoulder width but then a rumble strip was placed right in middle of it. Also, there was considerable debris on the shoulder. I had to be careful to avoid the shredded truck tires since the little metal wires can cause flats that are hard to diagnose. 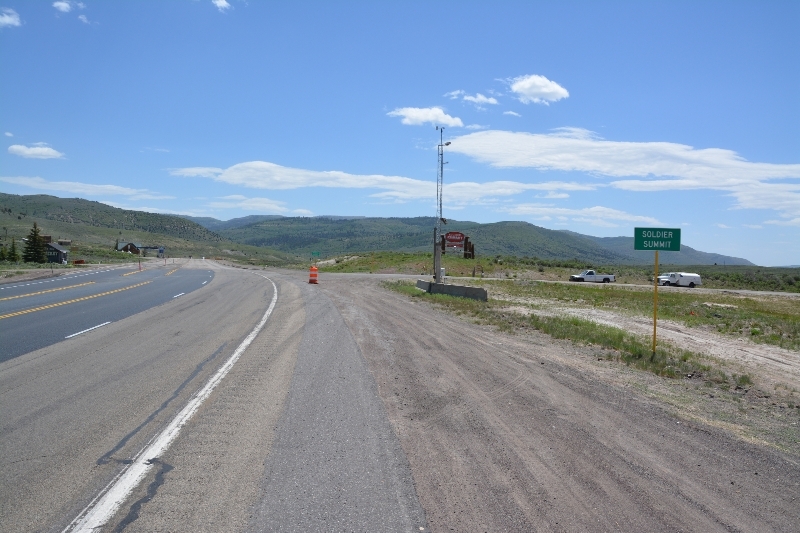 The road varied between one lane and two lanes and Utah Department of Transportation (UDOT) tells us the road volume varies between 9000 vehicles per day in the Utah Valley to 4500 vehicles per day near I-70. 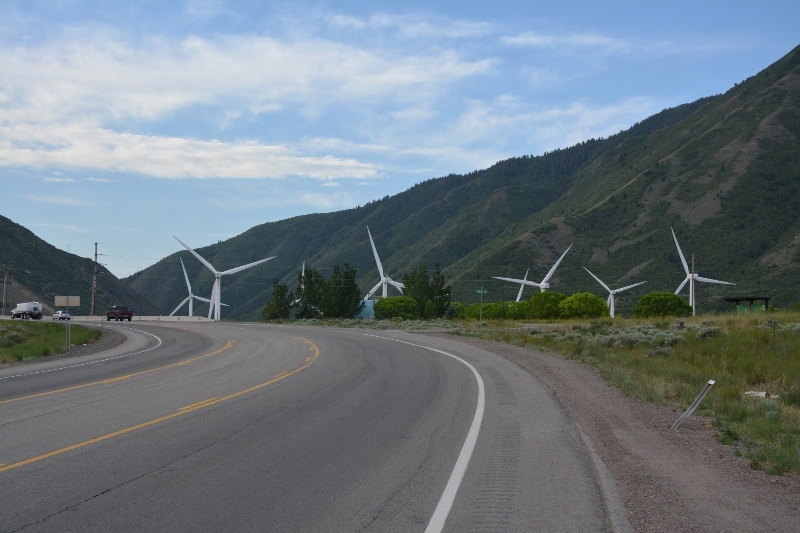 (In contrast US 50 across Nevada was more typically 800 vehicles per day). So it was also a busy road. At 15 miles the road started climbing a bit more and also became two lanes with passing lane. It was also marked as construction zone, though the work was recently completed. It looks like they added a new layer of chip seal. The chips were coarse and hence rough riding. This also hid but didn’t get rid of the rumble strip. After three miles of this climb, came to road intersection with US89 and had a slight descent. 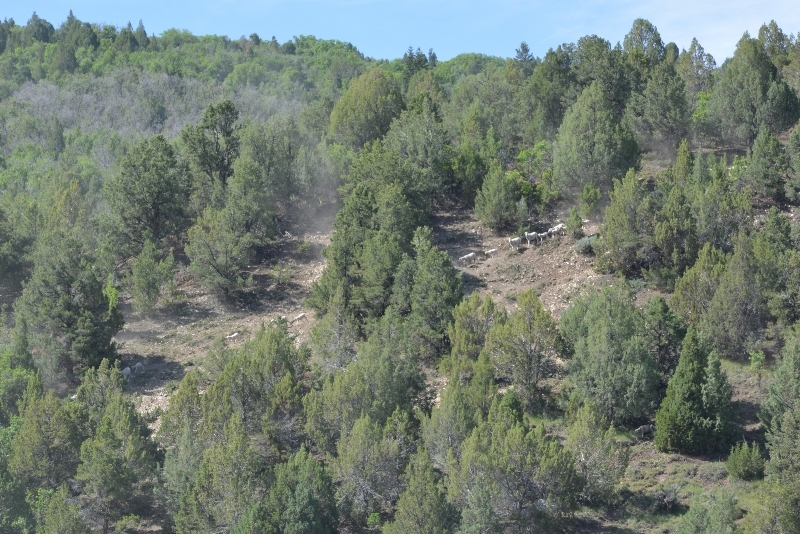 Photo above shows sheep I saw along the way that were being herded over top of the mountain. There were also horses and cows along the route. At 34 miles there was a very nice rest area and chance to stop. 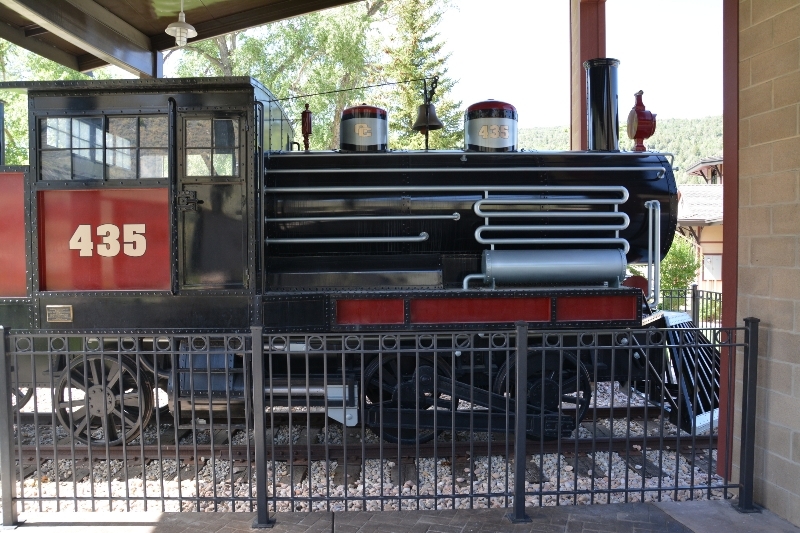 In addition to rest rooms there were tourist information boards, historical plaques and also this train replica. After the rest area the road stayed four lanes from here up to top of Soldiers Summit at 42 miles. The last few miles of this climb were road construction. They were milling the old road surface and putting down new layer of asphalt. The road narrowed to a single lane and cars were being shuttled with pilot car through the area. Fortunately, the new asphalt dried quickly and the flaggers allowed me to ride on new portion of the road. There were one or two spots where I needed to carefully go past the active construction, but it was a reasonable ride. Soldiers Summit was at 7500ft so I had slowly climbed 3000ft over the past 33 miles. From here with one exception a slight descent mostly until mile 54. It was also more open here and hence the winds would push my bike around. 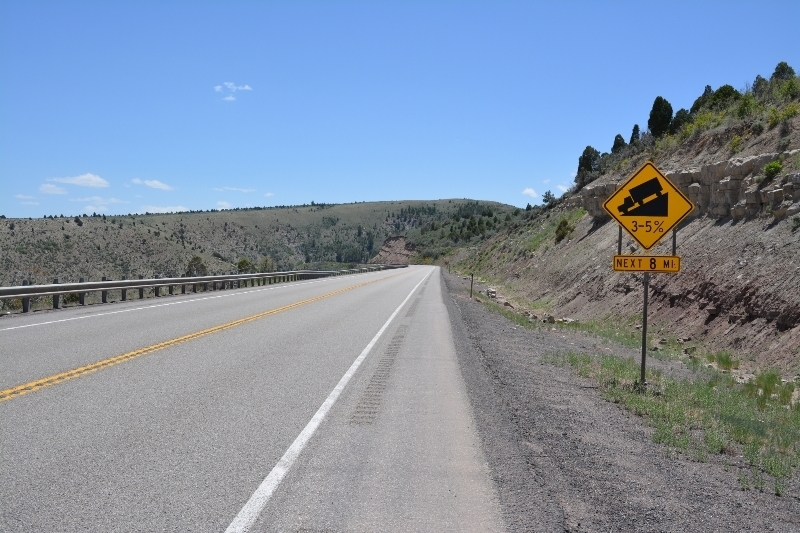 At 54 miles, the downhill became steeper as the road went through Price Canyon. The canyon itself was a nice ride and route continued to alternate between two and four lanes. At 62 miles there was intersection with road to Duchesne and three miles after this it went through Helper. By now the canyon opened up and the route also became flatter. Last miles into Price was on wide four lane road with the best shoulder I had all day. So overall, not too difficult of a ride to bring me across the mountain and down to Price.